← V.M.Zito guest blog and The Return Man reviewed. The Wayland family – Lara, Marcus and their three children – is leaving England to spend a long, blisteringly hot summer in Trout Island, upstate New York. Marcus has been offered the lead in a play and Lara, still reeling from the abortion Marcus insisted on, hopes the time away from home will help her to love her husband again. A chance meeting at the play’s opening night party reacquaints the family with an old actor friend of Marcus’s. Stephen is everything Marcus is not; attractive, successful – and interested in Lara. As Lara feels herself increasingly drawn to him she knows it’s a dangerous game she’s playing. What she doesn’t know is that it’s also a deadly one. Okay, first up a quick confession from me – I haven’t as yet read ‘Cuckoo’, the highly praised debut novel from Julia Crouch and also published by Headline, but on the evidence presented in ‘Every Vow You Break’ it is something I really need to correct and soon. I was surprised at just how much of the author’s own life is set within the pages of this second novel. Lara runs, does graphic design work, has three children with an actor husband who travels with the family to upstate New York to work at a theatre company there – all of these are traits shared by Julia Crouch: I hope that the similarities end there, for it’s a novel of dark brooding tension where bad things are due to happen and the reader is led by the hand deeper and deeper out of the light of the sun and into the shadows. I was impressed by just how far into the book it was before the suspense really starts to ramp up, but it’s a credit to her writing that the characters and the dynamic between them gets the pages turning quickly from the outset. Taking some time away in the sunshine with the family in the coming months? 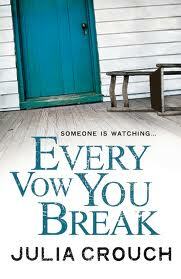 Grab a copy of ‘Every Vow You Break’ for your suitcase – after all, what could possibly go wrong? 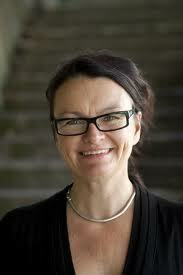 And you can catch up with Julia in person at this year’s Harrogate Crime Writing Festival too.